The VK 100 head is the same amp as the VK 212 combo. I’ve had two of these in the last couple of weeks; the first was fairly mundane….but the second! Wo-ho! There have been a few reports on various forums etc. about anode resistors blowing in these things; the reason for this is interesting. But, to start at beginning…..
Anode resistors do blow. Older amps are more susceptible than newer ones. No they’re not, necessarily. Resistors tend to go high as they age, and that can make them heat up more and that can make them go higher, and that can make them……you get the idea. The anode resistors in an old amp are often half watt rated, sometimes more. On a new-ish amp they are often quarter watt and sometimes less. There is a term in engineering design known as ‘over-engineering’. This means that the design in some way uses higher rated components than necessary. This makes for better reliability and (sometimes) performance. Peavey’s designs and constructions when built in the States, were plentifully over-engineered. Which is presumably why there are still plenty around from way back. Same could be said of Fender, Ampeg, Matchless, Gibson and a load of others. Open a new-ish offering of those things, and it becomes pretty obvious that it’s the profit margins that are over engineered (in China?) and they cut their fingers on everything else (personal opinion). This is where we are with the Valve King 100. 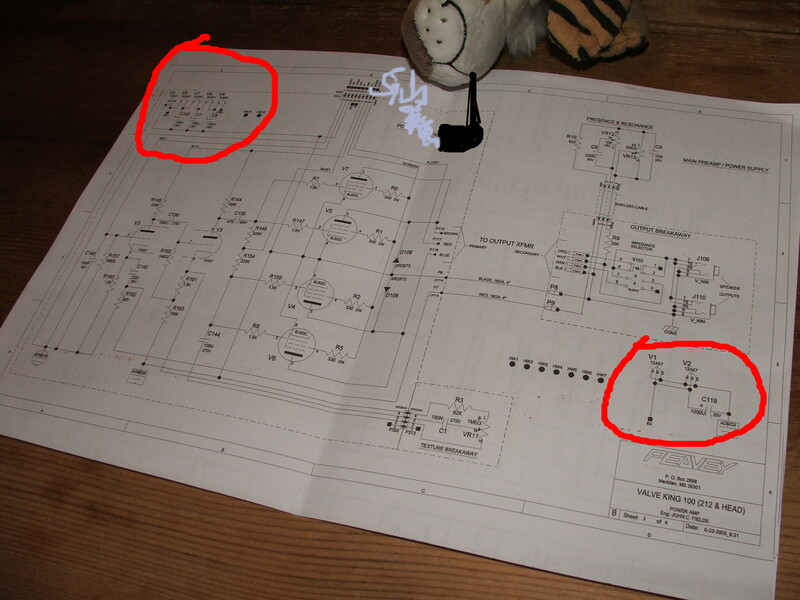 The two red marked sections are heater diagrams, and they reveal something very peculiar about this amp. V4, V5, V6 and V7 are the heaters of the output valves. They are in series, so that’s a bit strange; the heater supply is dc; so that’s also a bit strange; the three preamp valve heaters are in parallel with each other, and the whole lot are in series with the output valve heaters. So what? In the first place, there is about 32 volts to the heaters. Each valve has a 6.3 volt heater and the voltage drops through the chain of heaters so that each heater gets it’s 6.3 volts. So what’s wrong with that? Nothing, until a fault develops. Here we need to remember that a hot heater has a radically different resistance to a cold one. When first switched on, there is a surge, because all the heaters are a fraction of the resistive value that they are a few seconds later when warming up. 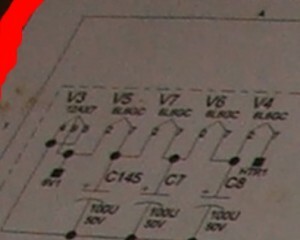 In this amp, if you take out a power valve, none of the heaters will work, because of the series connection. However, if you take out a preamp valve, this will upset the heater balance and put, say 9volts to the other two. Take another out and that becomes, say 12 volts. Heaters don’t last long in that situation. But there’s worse to come. If, having blown the hell out of a couple of preamp valves, you put in a cold valve, this will upset the heater supply to all the valves, because of the low resistance of the cold valve. But there’s worse to come. A fault that can happen (and had on the VK100 I had) is that an over voltage on the heater can distort it so badly, that it shorts its length against the cathode tube it is housed in. In this situation the dc heater voltage can be applied to the cathode. This upsets the bias of the valve no end and it draws a lot of current which can blow the anode resistor. Maybe then you might do a bit of swapping around with this dud valve and take out more anode resistors. R103,R104 and R101 were open on this one, but R144 and R145 on the phase splitter could easily have gone the same way. The big message with this amp? A REVALVE SHOULD BE ALL THE VALVES, NOT JUST THE 6L6′S. IF NOT, THERE’S A REASONABLE CHANCE THAT YOUR NICE NEW VALVES WILL VERY QUICKLY BE IN THE SAME STATE AS YOUR OLD ONES, ESPECIALLY IF THE AMP PASSES NO AUDIO AT ALL. Yes, alright, the capitals are a bit over the top. But so is your overdraft if the matched quad of mesa valves you got a second mortgage on just made a lot of smoke. A nice cup of tea……..and maybe…….a macaroon! This entry was posted in In the workshop by r0gerp7. Bookmark the permalink.